Big Ben had a monster game this week, throwing six touchdowns and a total of 522 yards. Fantasy owners must have been pleased, as Roethlisberger racked up 44 points in ESPN standard leagues. Newton finished Sunday’s game going 12-for-22 passing with 171 yards and a interception. He’s been great on the ground all season, but this week he had 24 rushing yards and a fumble. He’ll look to rebound on Thursday night against the Saints. The pair was fantastic against the Chicago Bears this week. Of Brady’s five touchdown passes, three of them were to Gronkowski. In addition, the two hooked up for 149 yards. For the second week in a row, Thomas has failed to produce. This week, he caught a season-low two passes for just 23 yards. Coming from a team led by Peyton Manning, you’d figure that he’d make some great plays but has been quite a disappointment. Sanders has been great this season and this week was no different. He finished Thursday night with 120 yards and three touchdowns in Denver’s win over the Chargers. 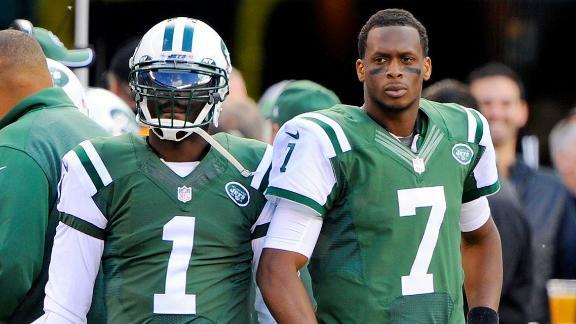 The worst possibility has set in for Geno Smith. He started against the Bills and was miserable. Smith was two-for-eight for five yards passing, plus threw three interceptions. He was pulled in the middle of the first quarter. Foster has been on fire lately. The Texans running back rushed for 151 yards and two touchdowns. Foster also added a receiving touchdown. He now has six touchdowns in his last four games. Nelson had been great this season but came away with a bad game. Although quarterback Aaron Rodgers had 418 passing yards, Nelson had just 25 yards. The Packers head into the bye week so Nelson will have to wait a week before attempting to bounce back in week 10 against the Bears. Maclin was put to work on Sunday with 16 targets. He finished the day with 12 catches for 187 receiving yards and two touchdowns. Larry Fitzgerald has been irrelevant for most of the season. He came into this matchup against the Eagles and came out with 160 receiving yards and a touchdown. Not bad. He’ll look to continue the success next week in Dallas.